HORROR-RAMA RETURNS! DAVID NAUGHTON ANNOUNCED AS FIRST GUEST! Get ready to bark at the moon, Toronto! HORROR-RAMA – Toronto’s ONLY straight-up HORROR and CULT MOVIE culture convention – is coming back with a VENGEANCE for its FIFTH and FREAKIEST year! And hey…the AMERICAN WEREWOLF himself is joining us! DAVID NAUGHTON, who – among many other credits – starred as the doomed werewolf David in John Landis’ 1981 horror masterpiece AN AMERICAN WEREWOLF IN LONDON, is the HEADLINE guest at this year’s show. His FIRST Toronto convention appearance! 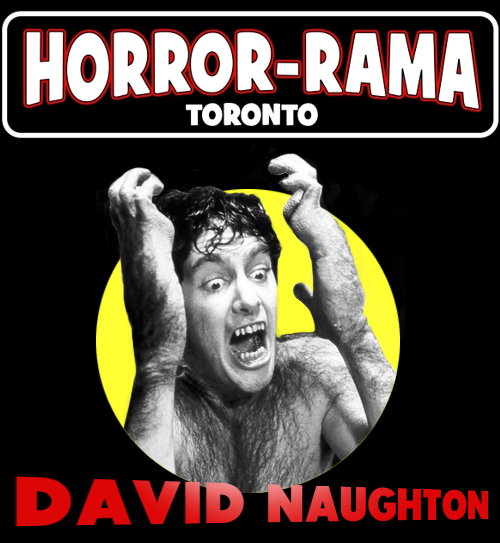 Naughton and many more AMAZING legends of strange cinema will be appearing at HORROR-RAMA 2018, which once more sets up shop at the wild and labyrinthine art space and converted Buddhist temple at 918 Bathurst Street. Two levels of killer guests, vendors and attractions and a whole mess of weird rooms with cool stuff inside them! HORROR-RAMA runs November 3-4, 2018.